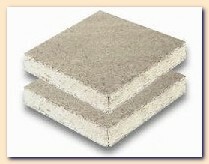 Laminated chipboard is a high quality material for furniture production. Moreover it can be used successfully in construction as: - interior décoration material - material for erection of separating walls Facing boards surfaces is realized by lamination (hot rolling application) by means of most modern german equipment manufactured by firm "GreCon". As is known, consumption and manufacture of wood plates in world are constantly increased. greatest rates of growth have wood-fiber plates of average density (MDF plates), used in furniture manufacture and at realization of painting and decorating in all types of premises(rooms), and plates from maxsize a focused shaving (Lam OSB plates). Plate MDF is made by a method of pressing of wood fibres with use organic binding in conditions of a high pressure and temperatures. 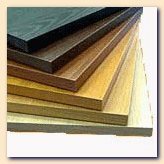 To manufacturing plates MDF it is applied, as Rule, low-grade wood and waste products woodmanufacture. Plate MDF has one Native dense structure due to what by opportunities of machining she(it) it is significant Surpasses a natural tree. Especially it is necessary to note, that by manufacture MDF of plates persons of pitch dangerous to health and phenols, that is an end-product are not used It turns out non-polluting. Now annual waste products wood manufactures make more than 140 mln. a cube and Quite may form a basis " for intensive development of manufacture of wood plates. Conducting West-European firms already have estimated perspectivity of an investment of means in construction of own factories on manifacture wood plates OSB and MDF in Russia. Attractive is blank The Russian market on OSB, MDF and Lam OSB to plates. Lack in Russian market boards materials of an optimum parity(ratio) cost - quality will be filled already in near future due to commissioning of factories of various capacity equipped with modern equipment. Among first on Russian market there came Austrian companies. Now for manufacture of plates MDF and OSB, basically, uses coniferous breeds of wood due to what plate has a soft yellowish shade. As raw material wood of poor quality, as a rule, is applied to manufacture of plates, so-called technological wood, and also - waste products wood manufactures ( wood bark ), that is that Product which for today practically does not find to itself application. Plates MDF are used for manufacturing decorative furniture facades, ideally approach for creation of a skeleton of various subjects of furniture, and also - for furnish of an interior, such as panel, dekor rods, plinths, structures, table-tops. To expand sphere of application it was possible due to introduction of an additional stage in process of manufacture of a plate: wood - clears of a bark that provides to it(her) a homogeneous light shade and homogeneous structure at which processing there will be no infringement of integrity of a surface because of presence a bark, besides production has equally light color. This one of main advantages of technology before manufacturers of plates MDF. Except for it it is made panels for facing walls and structures. And at an exhibition laminated floor coverings and panels made on basis MDF and OSB of a plate were submitted. Exhibiting of laminated floor of Russian manufacture for visitors was present sensation, you see before laminated was imported exclusively from abroad. Begun positive changes in sphere wood facilities(economy) of Russia already become tendency, that at once has an effect for market offer. At presence of a growing demand for qualitative production from plate MDF, Russia gradually turns to supplier of high quality products from wood with big opportunities and prospects. And this tendency is obvious not only to experts and leaders of branch.